Darren Hole’s company, Dude and Arnette, first came to our attention in w2006, when we were looking to replace our existing, very noisy, dilapidated cowl which had been in situ for only six years. 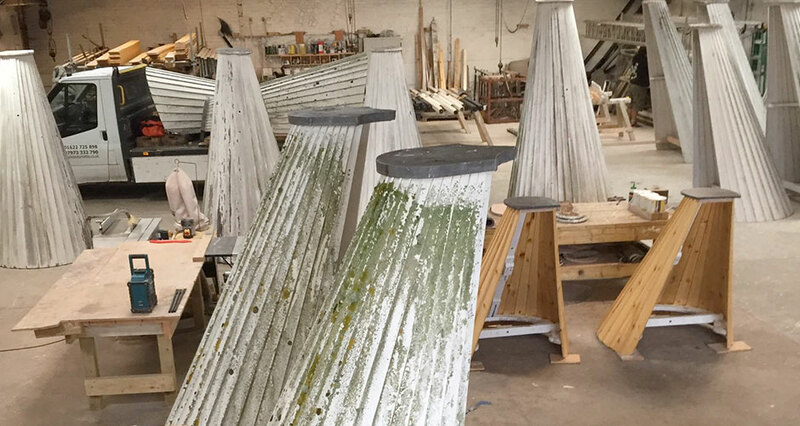 We searched the internet for a company that specialised in oast house cowl construction and refurbishment and came across Dude and Arnette, which has been in oast house cowl construction in Kent since 1937. Their site seemed to tick all the boxes and we asked Darren to look at our cowl. When he removed it we could see that the cowl was beyond repair, it was almost falling apart, and he gave us a very competitive price for a new cowl. The workmanship and quality of the new cowl was superb. He even made a silhouette of our much loved retriever to go on the finger. The cowl is a real feature in the area and attracts many admiring comments from neighbours and dog walkers. However, after eleven years we felt the cowl needed a bit of tlc. We contacted Darren and he gave us a very acceptable quote for removal, repair, refurbishment, five coats of paint and refitting. On inspection the cowl was in excellent condition, showing very little sign of wear and tear, despite everything that the elements had thrown at it over twelve years. Even Darren was impressed at how little repair would be needed, a testament to the quality of its construction. The cowl was then taken to Darren’s workplace for refurbishment and five coats of gloss paint. It was returned on Wednesday 4th October 2017 at precisely 9.00am (Darren is very punctual) looking extremely resplendent in its five new coats of white gloss and brand new retriever silhouette. It took only twenty minutes to refit and check that everything was in working order. The customer service offered by Darren and his team is second to none. Darren is very friendly and personable and nothing is ever too much trouble for him. He clearly loves what he does, takes great pride in his work and it shows in the outstanding quality of their product. His company really is a pleasure to do business with. They are professional, dedicated and reliable and we can’t speak highly enough of them. We would recommend them without hesitation.